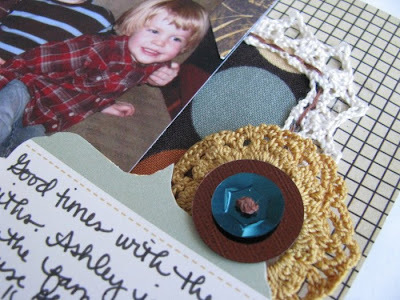 Today I'd like to share the first layout I made with my January "City Life" kit from Polka Dot Whimsy. First, let me explain my process when I work with a kit. I will either instantly grab my favorite items and scrap with them immediately OR I'll take the items that intimidate me or aren't things I'd normally use on my own and challenge myself to use them first. With this kit, I was surprised to find a large square of brown/dot fabric and several sequins (large brown and smaller blue). I didn't dislike them - they were just items I would never have thought to scrap with if I had been selecting the products myself. So, instead of pushing them aside to use later (with scraps or not at all), I decided to work with them first. 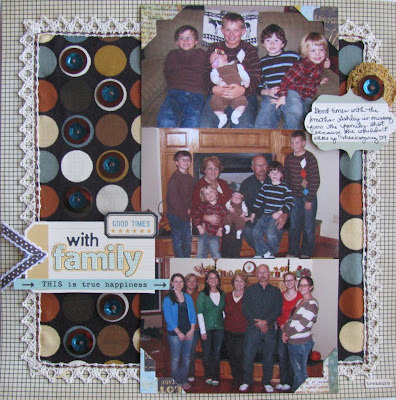 The color palette in the fabric reminded me of Thanksgiving, so I pulled out my photos from Thanksgiving and went to work to create my layout "Good Times with Family." And I love it! I instantly thought of layering the sequins over the dot pattern of the fabric. I chose to use a grid patterned paper (backside of a sheet of Cosmo Cricket paper) with the fabric in the center. To finish off the edges of the fabric, I trimmed it with one of the beautiful trims from the kit and added a hand-stitched border also. I kept my needle and thread out and sewed a "knot" (I'm sure there is a technical name for this) to keep the two different sized sequins together. I added them to the centers of some of some of the dots on the fabric and also used one as a flower center for my accent/journaling block grouping. Both my journaling block and the tag I used for the background of my title were cut out of patterned paper and then adhered with pop dots. (You know I love dimension!) I used a mix of alphas and a phrase sticker to make my title. So the Sassafrass Lass grid alphas would stand out, I backed them with paper (a sheet of notepaper from the kit) and also outlined them with a black pen. I finished off the layout by adding a piece of ribbon from the kit to the tag with staples. Then I added punched photo corners to my row of photos. I love that I was able to use so many different items from the kit. 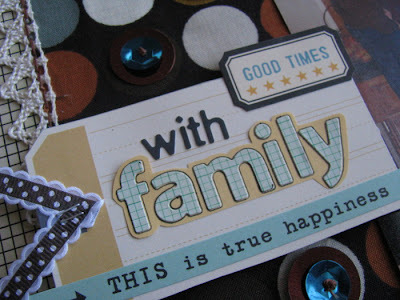 I think the use of fabric and trims provides the perfect "homey" feel for this layout about family. What a great layout!! I love how you used the lace trim. So cute! !